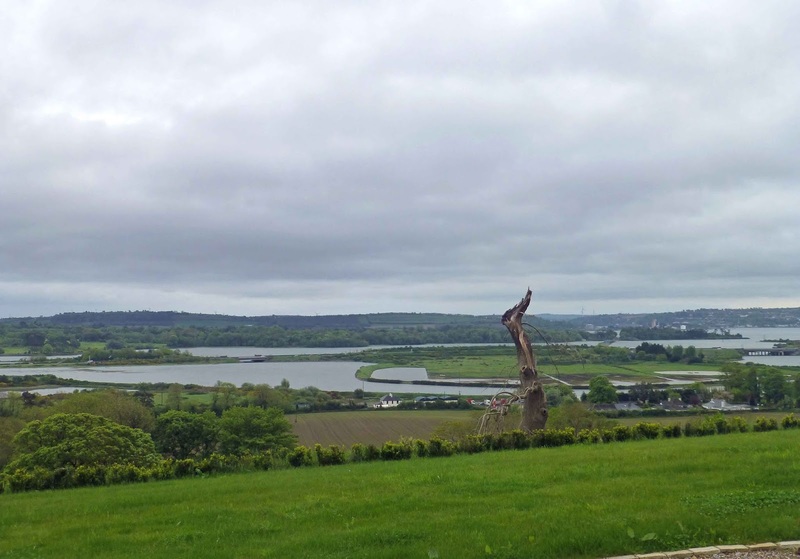 "We work on what the year gives us"
A group of members of the Munster Wine & Dine spent a very enjoyable evening on a tour and tasting at Killahora Orchards near Glounthaune yesterday (Tuesday). Barry was our enthusiastic guide as we got both our whistles and our feet (aside from those who had brought wellies) wet in a most delightful way. 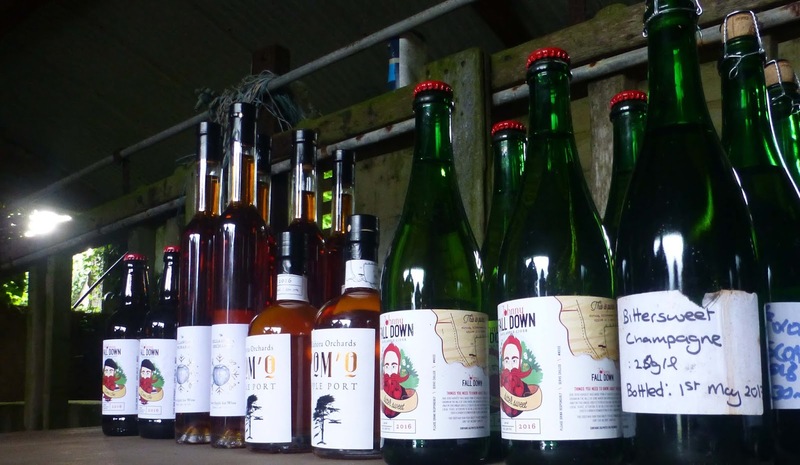 Some of us had already marked Killahora products, including Johnny Fall Down cider, the Pom 'O Apple Port and their unique Rare Apple ice wine, among our favourite things. Those who hadn't come across them before were converted on this tour and tasting. 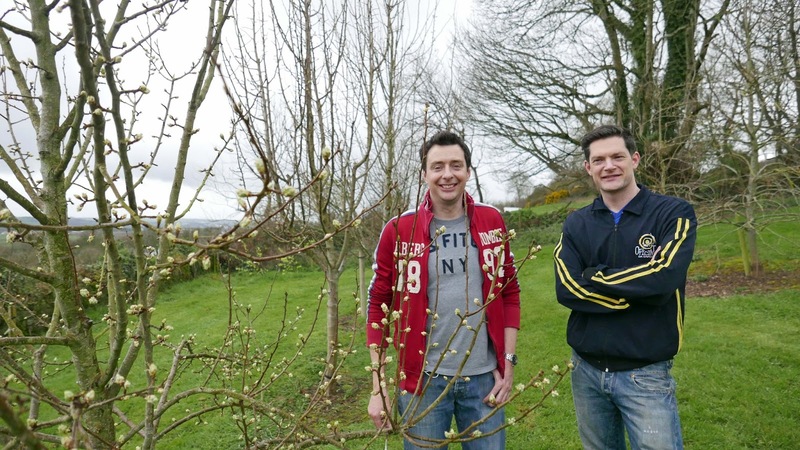 And Barry (and his cousin Dave) who are responsible for this innovative orchard have more in the pipeline. For more details on Killahora Orchards please check my January post here. Photos (and a few comments) from Tuesday's tour follow. 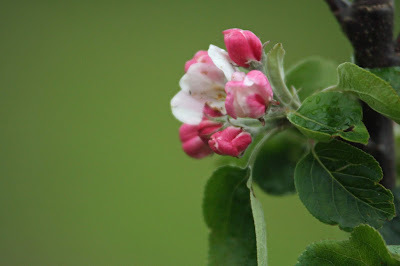 Blossom on a very young red fleshed apple tree. Rosé Cider? and also the fact that cows don't like tannins! Spray in the more established but still young orchard. The pears behind have already shed their blossom. Checking on how the grafts are taking. the wild ones going, to include in our mix." The tasting line-up (some of it!). "We work on what the year gives us." 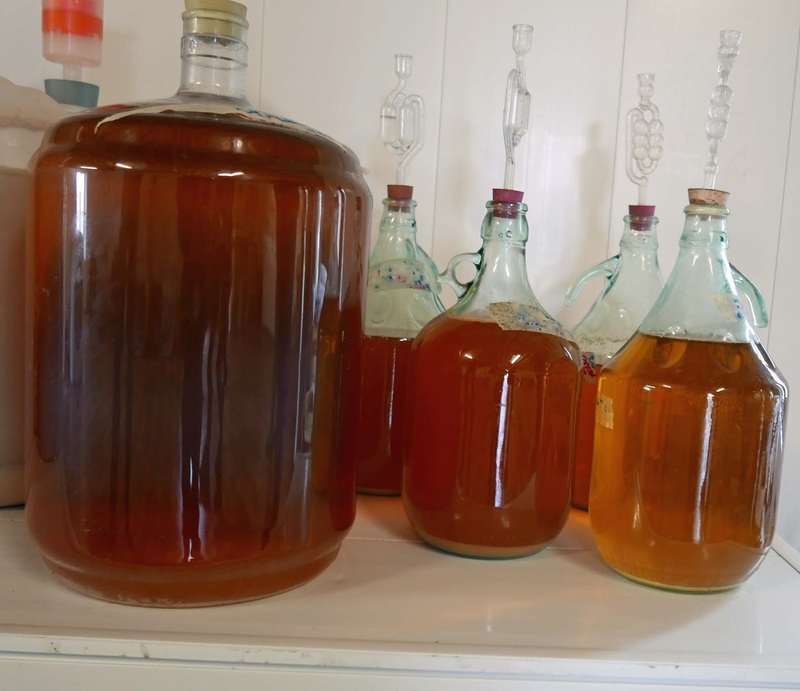 "In the cidery, we do as little as possible to it." 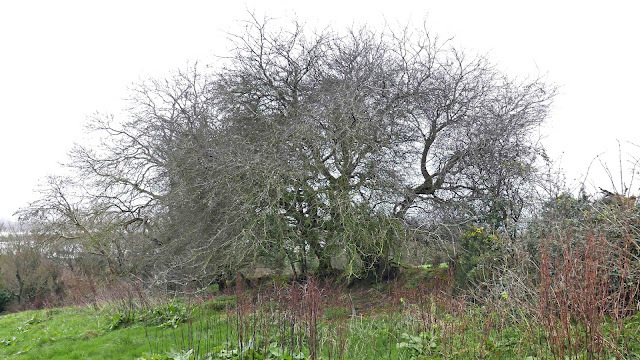 This Killahora tree appears on the Pom'O label. Johnny Fall Down. Warm Glounthaune slopes ideal for cider apples. A farm that has been recovered from a semi-wilderness is the unlikely scene for a craft cider revolution. 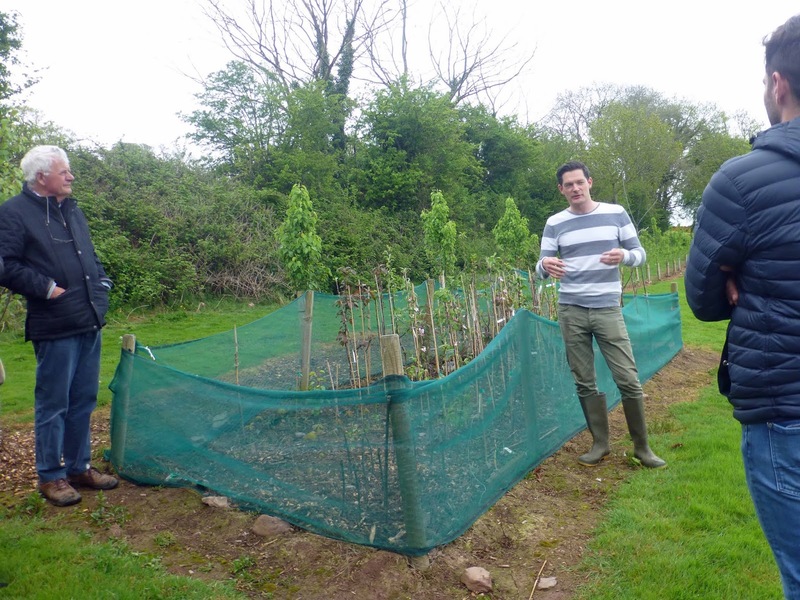 Thanks to Dave and Barry of Johnny Fall Down we had a tour of the fields at Killahora (Glounthaune) last week where the south-facing slopes are planted with over 40 varieties of apple. Not just apples. Pears are there in abundance. 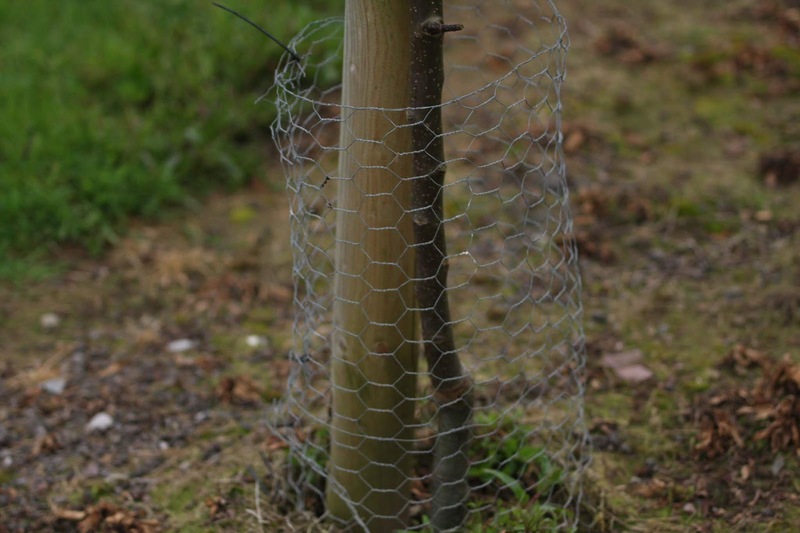 And other fruits trees too, including damson, plums. Even though this current operation started in 2010/11, there is a orchard history here, going back through the centuries, evidenced by an old wall (a relic of a walled garden). 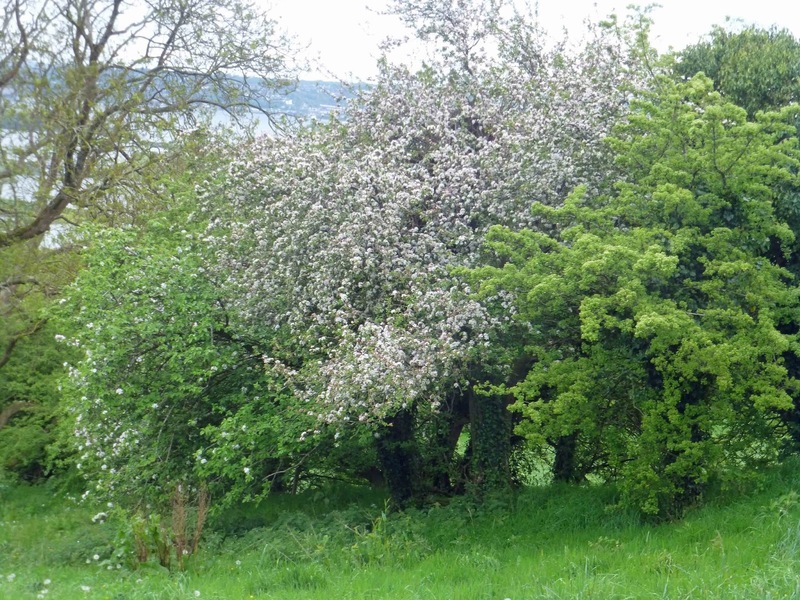 And reminders in the hedgerows, gnarled old crab trees and some wilding too. And it is not just fruit either. Dave has a particular interest in trees and plants and so here you’ll find some rare ones, everything from tiny Bee Orchids to huge (not yet!) Sequoias. They focus on the rare apple varieties here, Barry tells me, as we climb the slopes. “They give us more punch.” And you can try that for yourself. 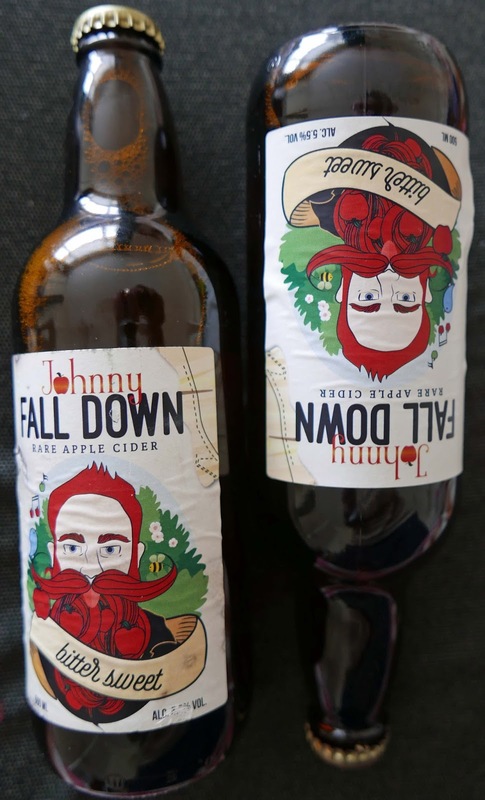 Their first product, the Johnny Fall Down rare apple cider, is available around Cork city in various pubs including Cask and The Roundy. The south-facing slopes are ideal. It just seems warmer there. 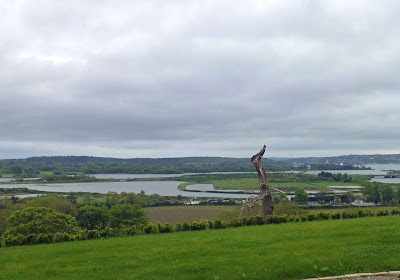 And, by the way, there is a fantastic view, a panorama of Cork harbour and estuary and the islands, including nearby Harper’s and Fota. And birds of prey hover above on the thermals. All the apples and pears (already in flower) are planted in neat rows, all tidy and well maintained. But those twisted old crabs trees in the hedgerows are amazing. The first one that we saw had hundreds of little apples, many of them quite sound, on the ground underneath, months after they had fallen. And they'll soon have company. Dave and Barry intend to plant fruits and herbs in and about the hedgerows. In a few years time, you'll see cherries and more in the wild. 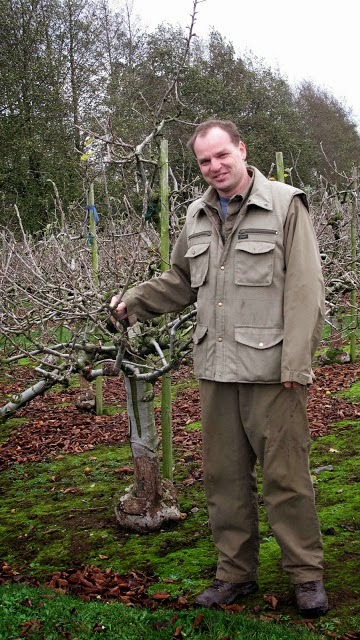 We were just in time to see Dave do a bit of grafting, a Turner’s Barn pear was being introduced to its host Pyro Dwarf. First he cut the Turner’s, at about 45%, down to the Cambium (layer of tissue in the middle), and repeated the procedure on the host. 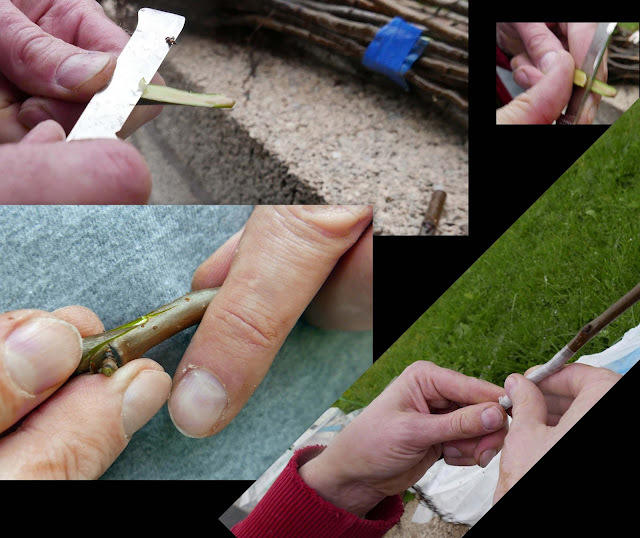 Then, the tricky part, making a tongue and groove so that the union would be even better. from an old crab apple tree! Then he bound the two with a bio-degradable tape (keeps in the moisture and allows the graft to take) and it was ready to go. “Not rocket science,” he humbly admitted. But still one just had to admire the enthusiasm and the precision as he demoed the ancient art. After the demo, it was work as hundreds remained to be done! Then, time for a tasting, starting with some of the single varietals. Some had the acidity to the fore, others sugar, others tannins. Getting the balance right is the challenge for Barry in the months and years ahead. Could be drinking from the fruit of this in about five years time! It won't be just cider. Already one of their products, a pommeau, is being used in cocktails. Barry also plans a Perry, champagne style! Perhaps the one that made the biggest impression on me was the Ice Cider, even if it was still only half-way on its journey. I usually - inadvertently, I hastily add - pick the expensive ones. “A lot of juice required to make this!”. And soon we would say goodbye and leave this beautiful part of the parish behind. The terroir seems to be just perfect for purpose and Dave and Barry complement each other perfectly also. Their knowledge and expertise is top notch. And there is enthusiasm in abundance. More importantly though, there is patience, there is no rush, they’ll wait for nature (magic in those hedgerows in years to come) and produce accordingly. I can’t wait to see what Killahora comes up with next but Dave and Barry can and their products will be all the better for it. Watch this space. And what of the man himself? We read on our sample bottle that Johnny Fall Down is a rare apple cider, bitter-sweet with an abv of 5.5%, made from 42 varieties of cider, many of them unique to the Glounthaune producers. It has a lovely light amber colour, bubbles galore on the rise. Aromas hint of really ripe orchard fruit and there are hints of tropical fruit on the well balanced palate. The "rosé like" finish comes from a mix "of rarer tannins" that have matured for six months. Well worth waiting for! 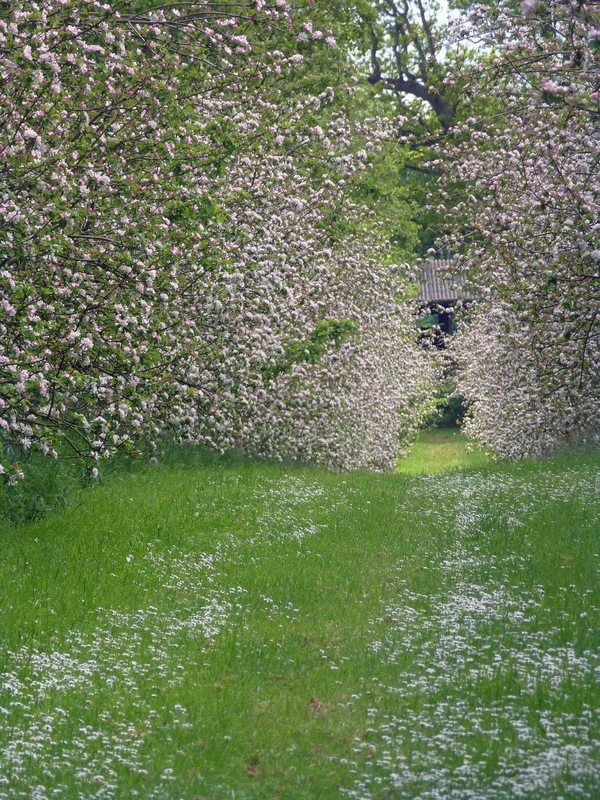 I’m walking through long rows of apple trees, all in blossom, pink and white abound. 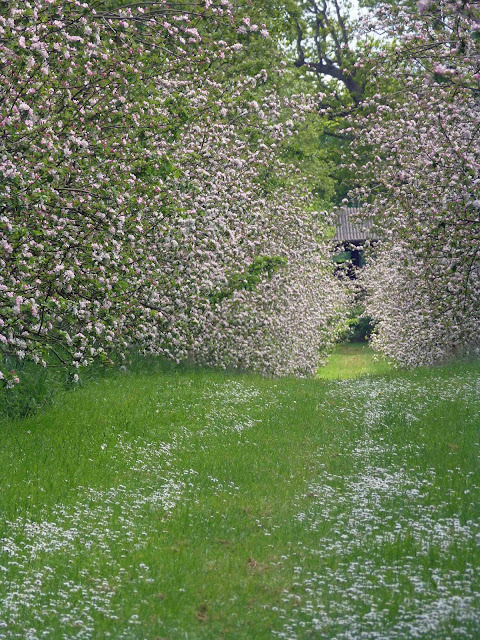 The grass between is ankle height, lush and liberally populated with white daisies. Lush, but recently topped. Had I been there a week earlier, I would have seen battalions of dandelions. 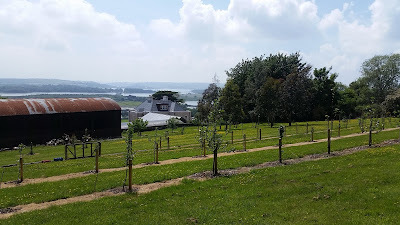 I am in Kilkenny, in the healthy heart of Highbank Orchards, an organic farm owned and managed by Rod and Julie Calder-Potts. 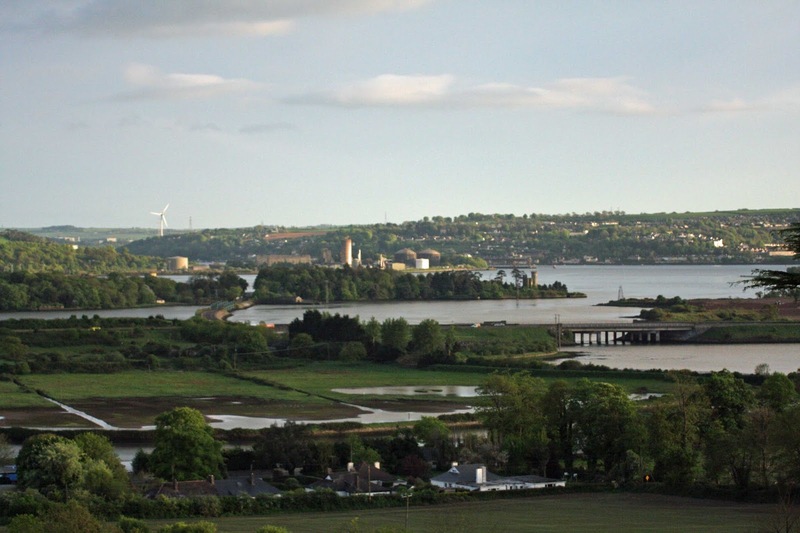 This is excellent land for farming, recognised as such for many centuries - even the Normans had their eyes on it. The farm-yard is 17th century, the house is 19th, and the distillery (which I've come to see) is 21st. Now though, on a lovely May evening, all is calm as Rod takes us through the orchard, though not through all its twenty acres. 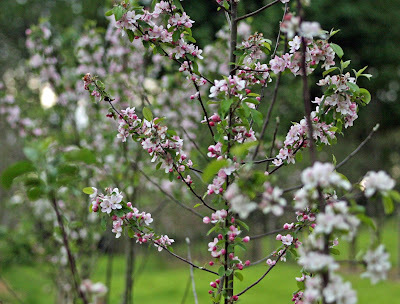 Fourteen of these are mature, planted with quite a few varieties, including Dabinett, Blusher, Bramley and, scattered in among the others, that lovely juicy Katy. 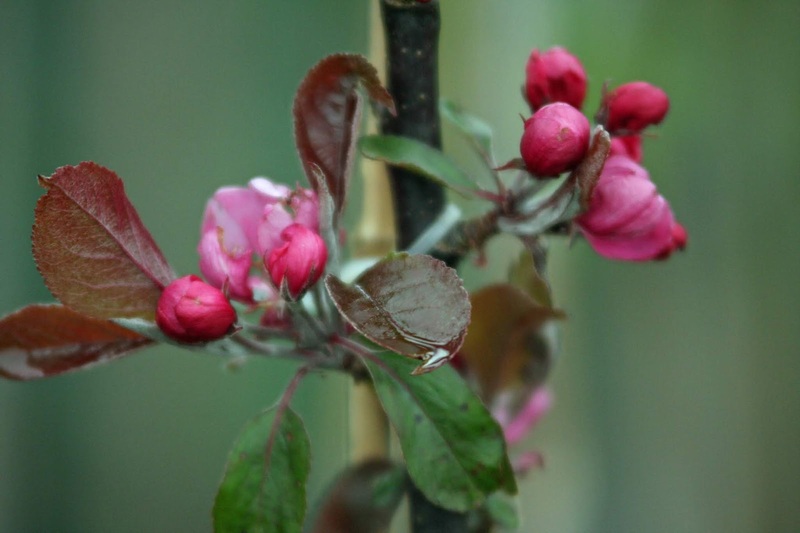 Katy is an early apple and has lost its blossoms. Nothing has been sprayed here for twenty years. 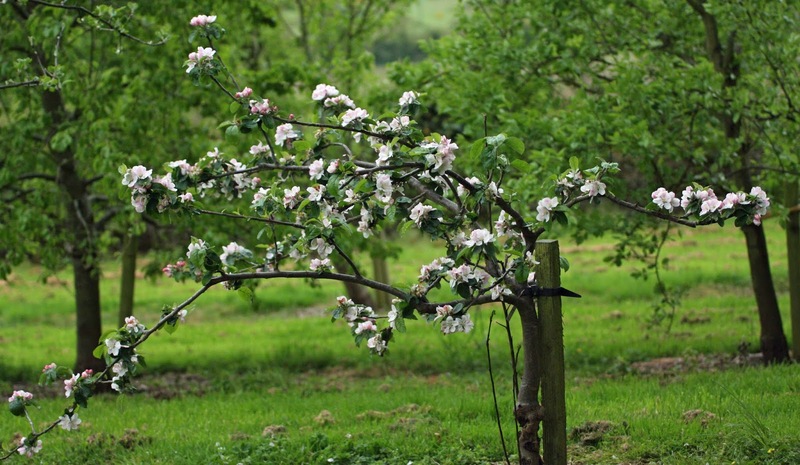 It is not that nothing ever threatens the apple trees but they are essentially healthy and can look after themselves. And Rod reckons much of that is down to the microbes in the soil, billions of them, all "working", not necessarily together - some eat one another - but combining to preserve the habitat. 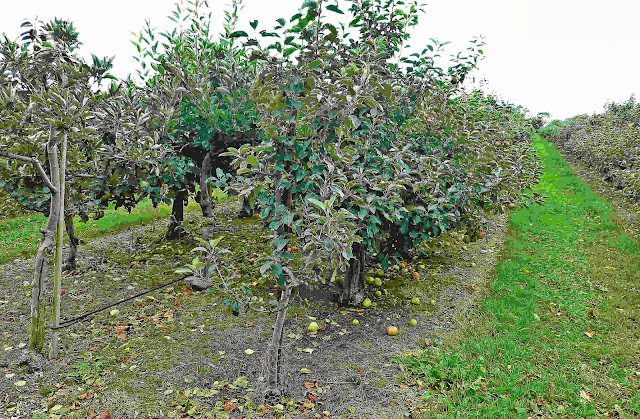 They are not disturbed, not traumatized by chemicals, and so the orchards live on and thrive. “Soil health depends on a thriving population of organisms”, says Dan Barber in The Third Plate. 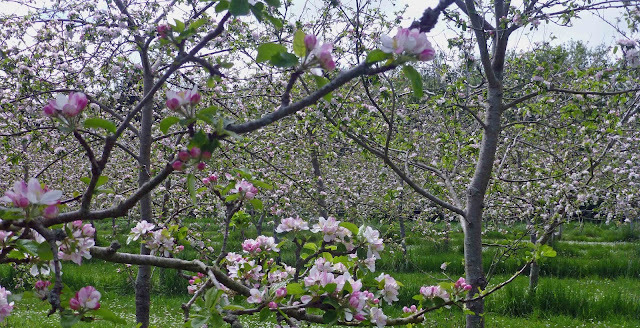 The next big occasion for the orchard is, of course, the harvest. The Calder-Potts keep the apples on the trees for as long as possible, indeed they allow them fall off naturally when fully ripe. Then they are swept up and taken to the nearby yard. They are transferred then to the apple press, an expensive piece of kit, and the juice is extracted to be used in the delicious products that Highbank now produces: Apple Juice, Apple Juice with Organic Mulled Spices, their famous Orchard Syrup (Ireland's answer to maple syrup and launched in 2010), Highbank Drivers Cider (a delicious, sparkling refreshing non-alcoholic drink), Highbank Proper Cider, and a honeyed Medieval Cider. Recently they have moved up the ABV scale with the installation of their little distillery and are making Gins, Pink Flamingo Gin and the premium Crystal Gin. And there’ll be more! We enjoyed the tour of the bright new distillery. It is small. The operation is small-scale, bottling is done by hand. Small yes, but these are top class products. 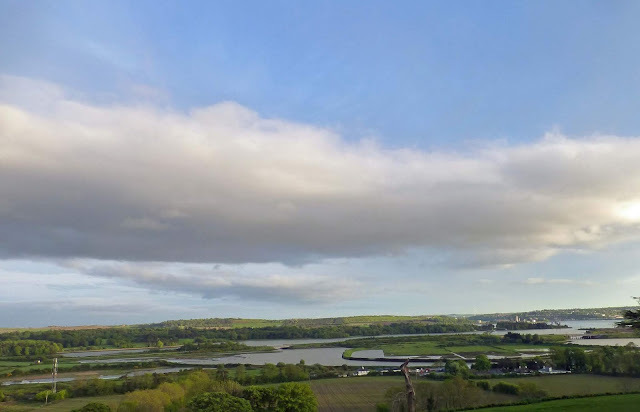 Highbank is the setting for many events but most notably, from a food point of view, they have hosted the Keith Bohanna Bia Beag series with subjects such as artisan bread, locally roasted coffee, bean to bar chocolate. And, of course, there is the Highbank Christmas Food and Craft Fair. 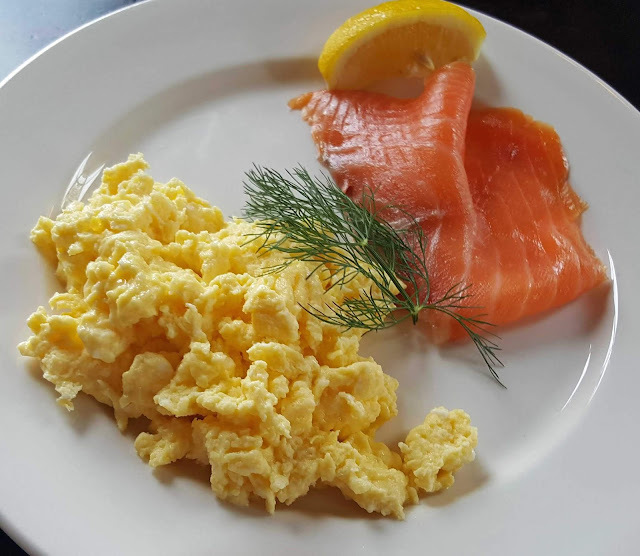 They are a busy couple and you’ll see them at markets and food festivals all over the country, including most recently, Sheridan’s and Ballymaloe LitFest. Besides, they are involved in promoting good food generally. Kilkenny too is naturally close to their hearts and so we couldn't have had a better guide on a quick Saturday morning run through the marble city than Julie. She showed us, with pride, restaurants such as Zuni and the Salt Yard, Slice of Heaven and its newly opened cookery school, the food hall at the Kilkenny Design Centre. Then you need something to serve your food in so off we went to Nicholas Mosse in Bennettsbridge, you need some nice lighting while dining and we got that at nearby Moth to a Flame (Larry Kinsella’s hand-made candles) and you also need something nice to look at on your walls and shelves and we found plenty of that at the Bridge Pottery. Needless to say, the credit card took a bit of a hammering. On the previous afternoon, left to my own devices, I was on the drinks trail! Called to Billy Byrne’s Pub (the Bula Bus and its excellent onboard restaurant is parked in the back) and sipped some nice local beer by Ger Costello and a pale ale from 12 acres. Of course, I couldn't leave Kilkenny without calling to Le Caveau. Pascal himself was busy on the road but we did take advantage of the reductions for Real Wine Month and went off happy with a couple of his organic wines. And it was the drink that brought us to Kilkenny in the first place! In Highbank's internet competition earlier in the year, I won a meal at The Strawberry Tree and, in addition, I also won a bottle of Highbank's new Crystal Gin and that was in the car with us as we said au revoir to the Marble City and to two of its outstanding citizens, the Calder-Potts. 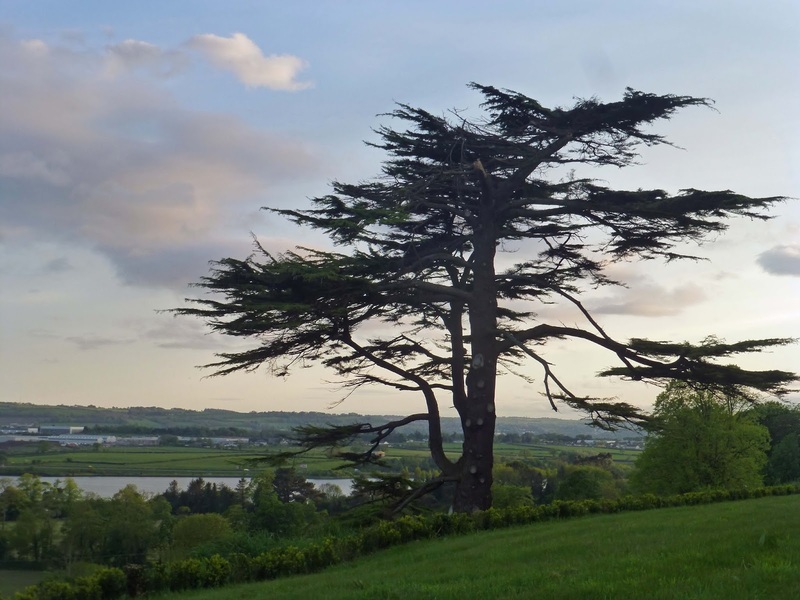 See also: Wild and Organic Tasting Menu at The Strawberry Tree, Macreddin. 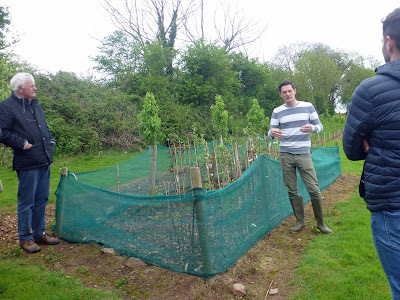 Con Traas of The Apple Farm, Cahir. Bord Bia, in conjunction with the Irish Apple Growers Association, is delighted to announce details of the inaugural ‘Blossom Walk’ which will take place on Saturday, 3rd May. As part of the event, seven apple farms and orchards nationwide will open their doors and gates to the public. 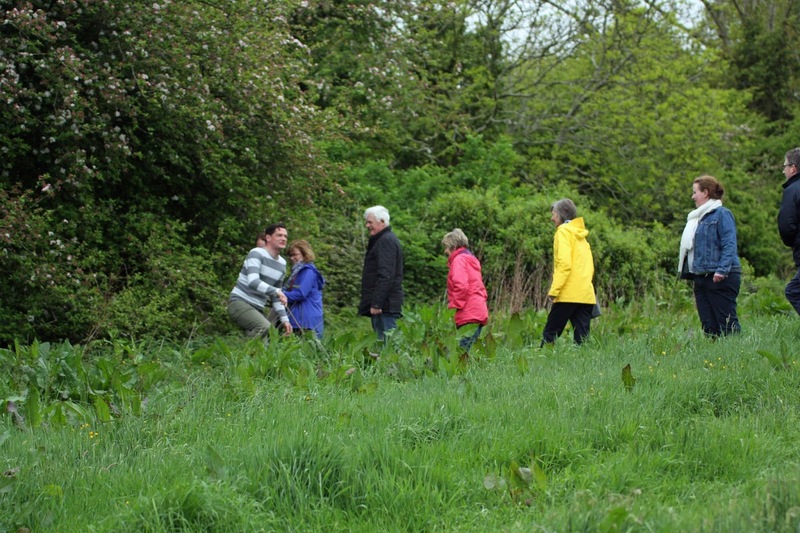 From Cahir to Cappoquin, members of the public will be invited to enjoy guided walks, engage with the growers, learn about the history of the individual farms and discover apple growing techniques. There will also be an opportunity to purchase some of the grower’s produce. The value of Irish apple production is almost €4 million according to Bord Bia and trade estimates. Culinary and dessert apple production accounts for 80% of the production value (€3.15 million), while cider apple production accounts for 20% (€0.78 million). Approximately 15,000 tonnes of Irish apples are sold each year with culinary apples representing 47% of total sales. There are currently 83 commercial apple growers in Ireland. Blossom Ireland was founded by two mothers passionate in the belief that their boys with special needs deserve the same opportunities as all children. Their goal is to go some way towards filling the gap between the available public services and the actual needs of the child and their family, particularly during out of school hours. Currently we provide dedicated, therapy led camps and after school activities for children with intellectual disabilities aged between 8 and 15 years. Blossom Ireland is a very young charity financed 100% by donations and fundraising. I have to say that I was surprised and delighted with my trip to the Apple Farm in Cahir last weekend to visit the Slow Food Cider Festival. The big surprise was the sheer variety of styles and flavours of the ciders in the tasting tent. Just incredible, everything from dry to sweet and beyond (including that organic Traditional Medieval Honeyed Cider by Highbank Orchards). I reckon they were all winners but on the day the judges decided on one and they awarded Best in Show to the, by now, well known and very well made Longueville House Cider, a 100% natural medium dry from their own orchards in Cork’s Blackwater Valley. 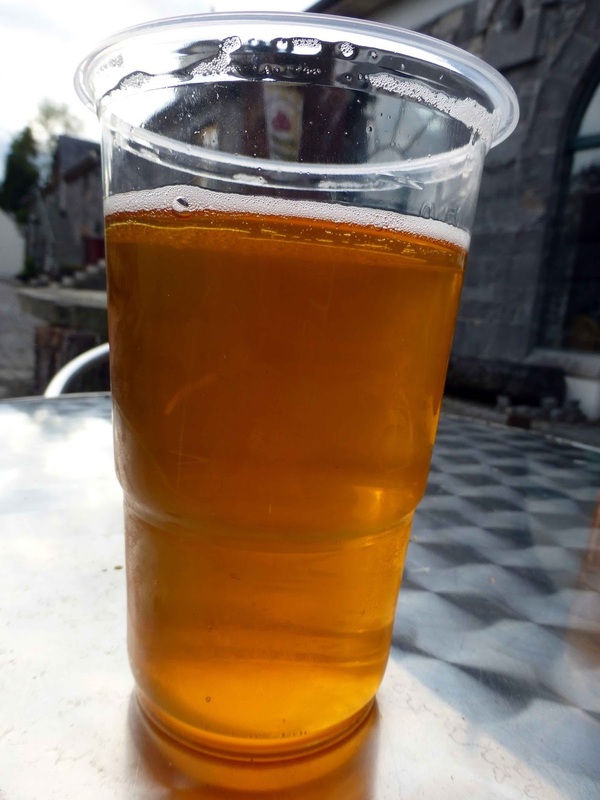 Lots of people think you have to have ice in your cider but producer William O'Callaghan disagrees: “It is best drunk well chilled with no ice and is an ideal accompaniment to fish and meat”. 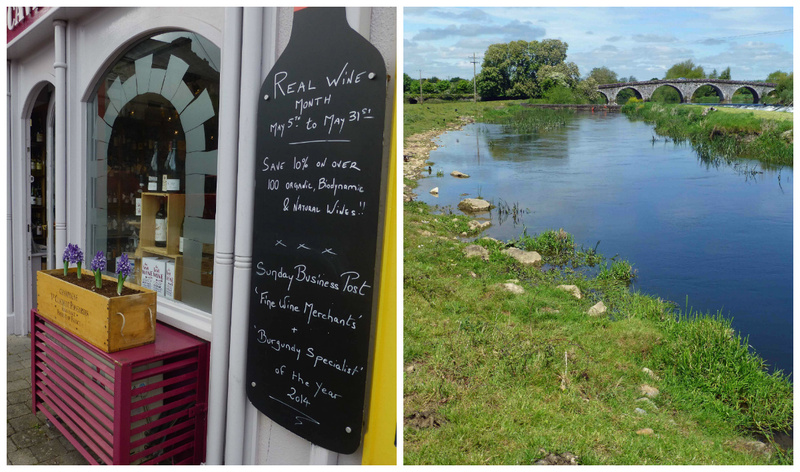 William, like many of the producers in Cahir, hasn't stopped with just one product. He was also showing his Apple Brandy (Calvados styled). And a very nice one too. This is really rich and mature and, in my opinion, not as fiery as some of its more famous counterparts from Normandy. 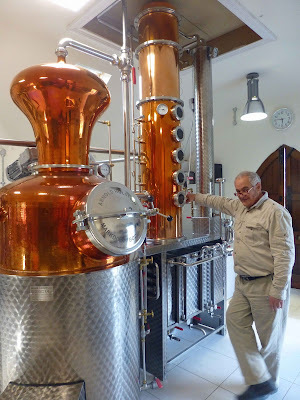 He also makes liqueurs, must get my hands on some of those! and don’t forget the New Year’s Eve Party! Lisburn’s Tempted? were displaying their new snake logo and “4 tempting flavours”, including the lovely Strawberry that won Gold at the 2012 Irish Food Awards. But, this time, it was their dry cider that was voted Best in Show in that category. Reckon they'll be keeping the Snake. And maybe that Question Mark. Must admit I concentrated on the dry when I visited the MacIvor’s stand but it was their sweet that won the Best in Show in that category. Great to meet up with Angus Craigie and Simon Tyrrell and taste their excellent cider, the Ballyhook Flier. Orpens and Keeved Cider’s Cockagee (not on general release yet) were other very enjoyable drops. 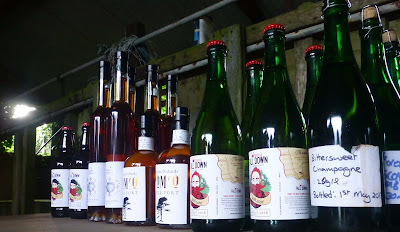 And then there was one with a difference from Kilmegan, their Wild Elderflower Infused Cider. Really gorgeous and worth a try if you come across it. Had a terrific chat at the Highbank Orchard stand. 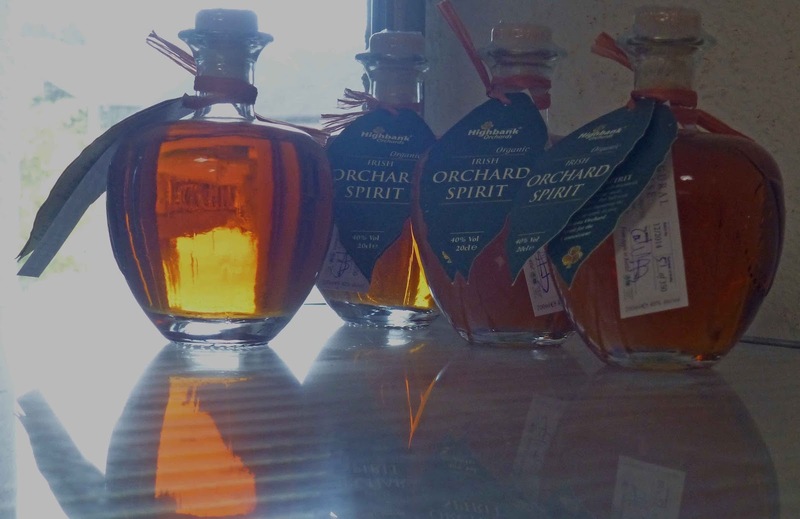 Knew some of the products, including their limited edition Proper Cider and the multi-purpose Highbank Syrup. But the Medieval Cider was new to me as was their sweet cider. 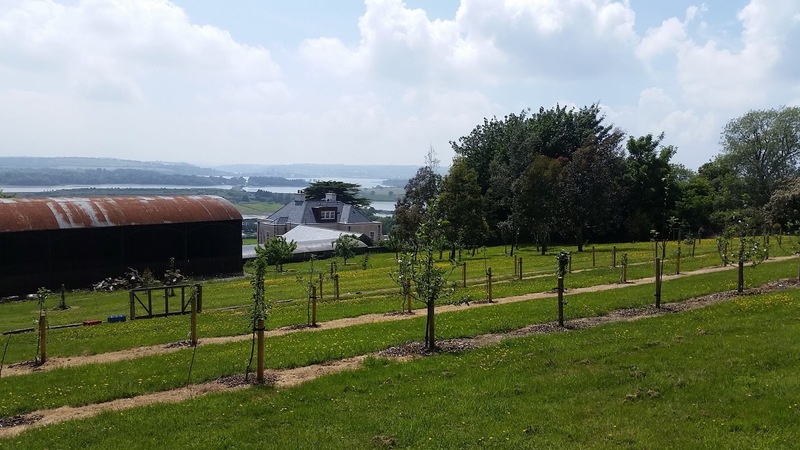 They are busy busy at Highbank Farm this month and have a day of family fun scheduled for the 29th. Click here for details. The main focus was rightly on the cider producers but there were a few other stalls as well and, of course, the famed Apple Farm Shop was open. Great to meet up again with Sarah Grubb, husband and children at the Cashel Blue stand. Amazing professionalism and a genuine courtesy to all as the couple managed to keep three young kids and a stream of interested callers happy. And we left here happy too with a small wedge of their Shepherd’s Store, a hard sheep cheese (you can't store the milk!) made during a good summer. It is a gorgeous cheese, with the trademark creaminess, and I'd advise you to get a wedge for yourself if you get the chance. Driving along the tree lined avenue to the Apple Farm in Moorstown (near Cahir) on the last day of November, I was expecting everything to be very quiet. Instead, it was quietly busy. The fruit trees, mainly apple and plum, may be more or less dormant but the maintenance work goes on. That was especially evident in the strawberry beds, raised on metal supports, where the dying vegetation was being trimmed back, leaving the crowns. Technique and timing are each important in the out of season work, especially in the pruning of the trees, and owner Con Traas is confident in the skills of his crew. Con, whose family came here from Holland in the late 60s, was at his desk, working on the winter edition of The Apple Club Newsletter. Typical of the man, the 1500 copies are printed on recycled paper. He plays a leading role in the food community in Tipperary, always keen to promote a good product (not just from Tipp) and always keeping an eye on the big supermarkets, especially on their “special” offers. Con took time off from the computer to take us on a tour, starting in the shop which is so well stocked with fruit, jams and juices. Then we saw his new processing shed, white and bright and nearing completion. While much of the work in the fields is manual, processing is largely mechanical as we saw when we visited the sorting and juicing areas. Apple Storage too is pretty high-tech as they are kept in a Controlled Atmosphere within the containers. The amount of oxygen, controlled within the container, plays a big role here in keeping the apples nice and fresh and crispy for you when you need them, even a few months from now. Then, back to the shop to fill the bags with loads of juice, including my favourite, The Sparkling Irish Apple Juice, fruit (eating and cooking apples) and also lots of jam (mainly the plum, another favourite). It is the apple time of year, lots of them now becoming available at fruit farms and in the farmers markets. Thanks to our friends at All Recipes UK and Ireland, we’ve got no less than 482 apple recipes for you! More than an apple a day. Find apple recipes for all of your favourites - apple cake, apple crumble, apple pie. They have savoury ways with apples, too - apple-stuffed chicken breast, apple and cheese bruschetta and more. Did you know that the Office of Public Works have an orchard at Barryscourt Castle, near Carrigtwohill. It is laid out to a plan typical of those in use in the 16th century. There are records of orchards there since the 13th century. Now is a good time to visit and see the fruits of so many varieties: including Beauty of Bath, Eight Square, White Russet, Irish Peach, Summer John, Northern Green, Worcester Permaine and many more. There are also plantings of pears and quinces here. There is a notice board with details of the plants found in and around the castle, including medicinal plants such as mullein and woundwort and herbs such as parsley, “found in a variety probably surviving from the Middle Ages”. Also present is butterbur, which was used to wrap butter for market. In the bawn of the castle, there is an herb garden and also a knot (box hedge) garden. There is no entry fee to visit the garden (or the castle itself). To read my new post on BARRYSCOURT CASTLE please click here.